Made with distilled water and pure essential oils. These sprays are environmentally responsible, synthetic-free, petroleum-free, paraben-free, and phthalate-free. Our sprays are created from pure essential oils and are blended to enhance your mental, emotional, and physical well-being. Our intention is to use ingredients from earth that nourish, heal and protect the body instead of using harmful synthetic chemicals that are cheaper and compromise the immune system. 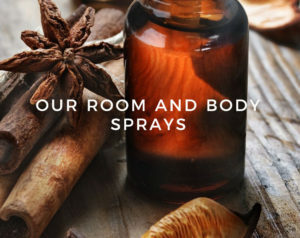 Body/Linen Spray: With all the synthetic additives and potentially toxic ingredients in commercial perfumes, it’s no surprise many people are opting for the natural aromas of essential oils to create beautiful fragrances for the body and linens. We are passionate about what we put on our bodies and promise that all of our sprays only contain 100% essential oils and distilled water. Try swapping out your synthetic perfumes for one of our clean body sprays! Your body will thank you for the upgrade. Room Spray: No one likes to walk into a stinky room. Bad odors are gross, which is why an entire industry of air fresheners with aromatic scents is available. But did you know that most conventional air freshener products, including plug-ins, use a whole host of unsafe chemicals to block smells? This means that the sprays and products marketed as air “fresheners” are actually polluting your air. If you truly want fresh air, we’re all for opening the windows and ventilating. Conventional air fresheners—spray or solid—are a top source of airborne toxins. They don’t actually remove odors, but cover them up with stronger, long-lasting synthetic scents often released from so-called “plug-ins.” To work, they fill the air with hazardous chemicals including phthalates, terpenes, acetone, propane, and petroleum distillates.